In order to improve understanding of metabolic systems there have been attempts to construct S-system models from time courses. Conventionally, non-linear curve-fitting algorithms have been used for modelling, because of the non-linear properties of parameter estimation from time series. However, the huge iterative calculations required have hindered the development of large-scale metabolic pathway models. To solve this problem we propose a novel method involving power-law modelling of metabolic pathways from the Jacobian of the targeted system and the steady-state flux profiles by linearization of S-systems. The results of two case studies modelling a straight and a branched pathway, respectively, showed that our method reduced the number of unknown parameters needing to be estimated. The time-courses simulated by conventional kinetic models and those described by our method behaved similarly under a wide range of perturbations of metabolite concentrations. 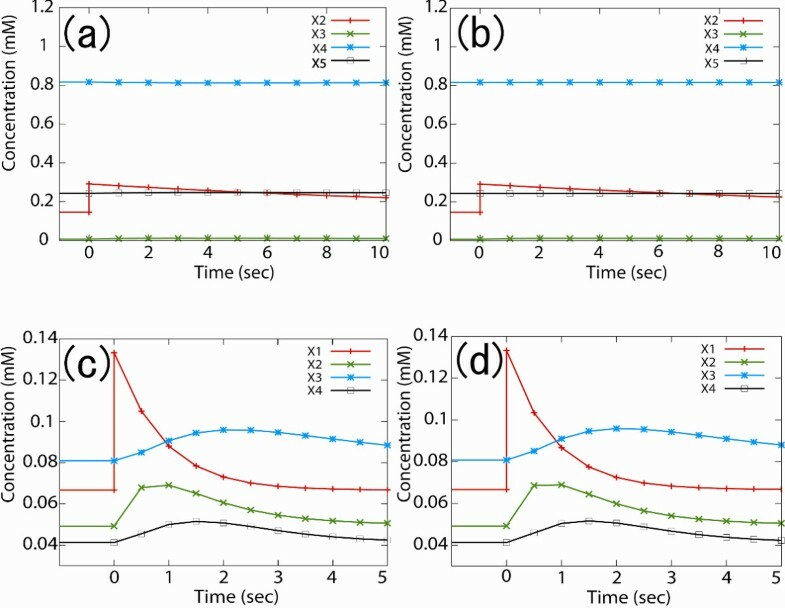 The proposed method reduces calculation complexity and facilitates the construction of large-scale S-system models of metabolic pathways, realizing a practical application of reverse engineering of dynamic simulation models from the Jacobian of the targeted system and steady-state flux profiles. Systematic modelling has emerged as a powerful tool for understanding the mathematical properties of metabolic systems. The rapid development of metabolic measurement techniques has driven advances in modelling, especially using data on the effects of perturbations of metabolite concentrations, which contain valuable information about metabolic pathway structure and regulation . A power-law approximation for representing enzyme-catalyzed reactions, known as Biochemical Systems Theory, is an effective approach for understanding metabolic systems [2, 3]. Generalized Mass Action (GMA) and S-systems [4, 5], which are often used as power-law modelling approaches, have wide representational spaces that permit adequate expression of enzyme kinetics  in spite of their simple fixed forms. Moreover since S-system forms have a smaller number of parameters than GMA forms, the S-system is an appropriate modelling framework. The derivation of an S-system model from given experimental data is a powerful tool not only for understanding non-linear properties but also for determining the regulatory structure of the system [7, 8]. S-system modelling from time-course data is often difficult due to its non-linear properties. Non-linear-fitting algorithms, such as genetic algorithms or artificial neural networks, have been used to resolve this problem [9–14]. Although these methods can be applied to metabolic pathways, massive computing power is required in the case of targeted models involving a number of closely-connected, underspecified parameters . Moreover, the wider the range of targeted metabolic pathways, the more likely is the occurrence of local minima due to the expansion of the parameter search space. The network-structures-segmentation method can reduce the total parameter search range in genetic network modelling  but it is difficult to apply this to metabolic pathways because of the close relationships between reversible reactions and because of allosteric regulation. Diaz-Sierra and Fairén have proposed an approach, based on the steady-state assumption, that allows the construction of S-system models from a Jacobian matrix of the system . Since the Jacobian constrains the search range of underspecified parameters at the optimization stage, these authors' method allows efficient parameter estimation. However, the problem of an excess number of parameters requiring estimation remains unsolved. We present an approach to power-law modelling of metabolic pathways from the Jacobian of the targeted system and steady-state flux profiles with linearization of the S-system. This reduces the number of underspecified parameters. Two numerical experiments show that the S-system model generated by this method describes similar dynamic behaviour to that indicated by conventional kinetic models. As a first step, the Jacobian must be obtained from metabolic time-course data. In this section, we summarize the method of Sorribas et al , which we use in this work. where J is the Jacobian matrix, and δX represents a small perturbation and contains the concentration Xi as its elements. The elements of the Jacobian can be obtained from perturbed time-courses using linear least-squares fitting [17, 18]. This method is based on the fact that transients yield linear responses to small perturbations under steady-state conditions . The mathematical basis for this is that the linear representation constitutes the first-order term of a Taylor series expansion, which is sufficiently accurate in this situation. where αi and βi are rate constants, gij and hij are kinetic orders, and xi represents the concentration of a compound. where Flux is the sum of the steady-state fluxes into xi, and V+ and V- are production and consumption terms, respectively. where xj,0 represents the steady-state concentration of xj. Once Jacobian Jij, xj,0, and Flux are given, Eq. (10) is a constraint for the determination of the kinetic orders gij and hij. Savageau has described the linearization of S-system as an "F-factor" for stability analysis . We use this representation to estimate parameter values. In most cases gij and/or hij are available from the structure of the metabolic pathway; however, in the absence of known kinetic orders, parameter estimates are needed to determine them. In such cases Eq. (10) is adopted as limiting the parameter search range. In the first case study, we applied this approach to the published biochemical model of yeast galactose metabolism shown in Figure 1. This model consists of five metabolites, and four enzyme reactions mainly described by Michaelis-Menten equations. The kinetic equations, systems parameters, and initial conditions are listed in Appendix 1. The pathway of galactose metabolism . Substances (X1–5) represent the following metabolites in the paper referenced: X1, external galactose (GAE); X2, internal galactose (GAI); X3, galactose 1-phosphate (G1P); X4, UDP-glucose (UGL); and X5, UDP-galactose (UGA). The reactions are VTR, transporter of galactose; VGK, catalyzed by galactokinase; VGT, catalyzed by galactose-1-phosphate uridyltransferase; VEP, catalyzed by UDP-galactose 4-epimerase. X3 is an inhibitor whose rate is given as VGK. The kinetic equations, systems parameters, and initial conditions of this model are shown in Appendix 1. In this case, all parameters of the S-system model were determined, without the need for estimation. The biochemical model could be converted into the following S-system form. Since X1 is an independent variable, it was omitted from the listed rate equations. The branched biochemical pathway shown in Figure 2 was tested in the second example. This pathway has the typical features of a biochemical pathway: branching, feedback regulation, and product inhibition (see Appendix 2). X3 is the inhibitor of both V3 and V4. The branched pathway. X3 is an inhibitor of both V3 andV4. The list of parameters used in the above calculation is shown in Table 1.
where n is the number of metabolites in the model, m, the number of sampling points in the time course, x'i(t) represents the time course calculated from the created S-system model, and xi(t), the time course calculated from the original Michaelis-Menten model. In this experiment there were 10 sampling points, the interval between sampling points was 0.5, and X2 in case study 1 and X1 in case study 2 were the targets of perturbations ranging from 0% to 200%. The time-courses of metabolites in response to perturbations of 100% are shown in Figure 3. In both examples, similar dynamic behaviour was observed in the S-system model and the reference model as a response to the perturbation. metabolite changes in response to perturbation of one metabolite by 100%. (a) and (b) represent the changes in metabolites in case study 1 when X2 is the perturbation target, derived using the reference and S-system model, respectively. (c) and (d) are the changes in case study 2 when X1 is the perturbation target given by the reference and S-system model, respectively. The changes of MREs in response to the perturbation range are shown in Figure 4. The initial MREs with no perturbation were within 1%. Although a slight increase in MREs was observed in both case studies, they remained within 4% at a perturbation range of 200%. Changes in the mean relative error (MRE). Perturbations of the targeted metabolite ranging from 0% to 200% were applied. (a) Evolution of MRE in case study 1, in which X2 was the perturbation target. (b) Evolution of MRE in case study 2, in which X1 was the perturbation target. Power-law modelling from time-course data of metabolite concentrations often requires parameter estimates that depend on the size of the target metabolic network. Especially when developing a large-scale metabolic model, this requires problem-specific simplifications. Our method can reduce the number of underspecified parameters by using steady-state flux profiles and the Jacobian of the targeted system derived from time courses of metabolites, and is thus suitable for large-scale power-law modelling. To validate our methods we used two existing biochemical pathway models, the straight and branched pathway models, described by dynamic equations. In the S-system, modelling of a linear metabolic pathway with 12 parameters (case study 1), our method determines all parameters accurately, whereas the method developed by Diaz-Sierra and Fairén  leaves at least four parameters underspecified that include error correction parameters. In the case of the branched metabolic pathway with 16 parameters (case study 2), our method determines all but one parameter, whereas the method of Diaz-Sierra and Fairén has 12 underspecified parameters that include error correction parameters. The case studies demonstrate that our method of developing S-system models from time series can reduce the number of underspecified parameters more efficiently than the previously reported method . Furthermore, the perturbation response experiments show that the models created by our method can reproduce dynamics similar to the reference models, since the MRE was around 3% when the perturbation range was 200% (Fig. 4). S-system models generated by our method can provide accurate simulations within a wide range of the steady-state point. This limitation does not prevent the modelling and analysis of metabolic pathways, as it does with many power-law metabolic models [4, 5]. Robustness against experimental noise is an important requirement for the practical application of modelling methods. Since the Jacobian is rather sensitive to the noise in time series , a robust corrective response to the numerical errors contained in a Jacobian is important in developing a model involving its use. In the method of Diaz-Sierra and Fairén , error correction parameters are incorporated into the S-system model to reduce the effect of experimental noise. However, this approach may lead to an increase in the number of underspecified parameters. As an alternative approach to reducing the experimental noise in time-course data, the estimation of appropriate slopes using a non-linear neural network model is effective , and can provide an error-controlled time course that enables the Jacobian to be obtained with high accuracy. Methods for obtaining accurate estimates of the specific effects of general types of perturbation have been discussed  and might enable more precise analysis of data such as time-scale metabolite concentrations obtained under perturbations. To assess the robustness of our method against experimental noise, we measured the calculation error when numerical errors were manually inserted into the Jacobian or steady state fluxes. Table 2 summarizes the MREs of the simulated time trajectories of the S-system and the original Michaelis-Menten model. It is evident that the Jacobian is quite sensitive to numerical error because of the direct effect on a kinetic order of a Jacobian. Furthermore, the steady-state flux profile data may include experimental noise. However, the models created by our method are relatively robust to errors in the Jacobian and steady-state fluxes, indicating that these methods will be useful in practice. Mean relative errors (MREs) as a function of experimental errors. The MREs of the S-system models and the original models were measured in case study 2. The time-course data obtained from the models included the perturbation-of-state variable in order to examine the difference in dynamic response between the S-system model and the original Michaelis-Menten model. The Jacobian and steady-state fluxes were reproduced with a 100% numerical error. Numerical errors for the Jacobian were inserted equally into all the elements of the Jacobian. X1was the target of the perturbation. The time-course data were obtained from the S-system model where X1was perturbed by an increase of 50%. Ten time points were sampled for the calculation, with an interval of 0.5 s between them. The MRE was calculated from the time-course data in the S-system model and the original Michaelis-Menten model. In the case of the branched biochemical pathway (case study 2), the Jacobian was increased by 100%, and the three steady-state fluxes, J1–2, J3–5, and J4–6represent the flux through V1 and V2, the flux through V3 and V5 and the flux through V 4 and V6, respectively. Sorribas and Cascante proposed a method for identifying regulatory patterns using a given set of logarithmic gain measurements . 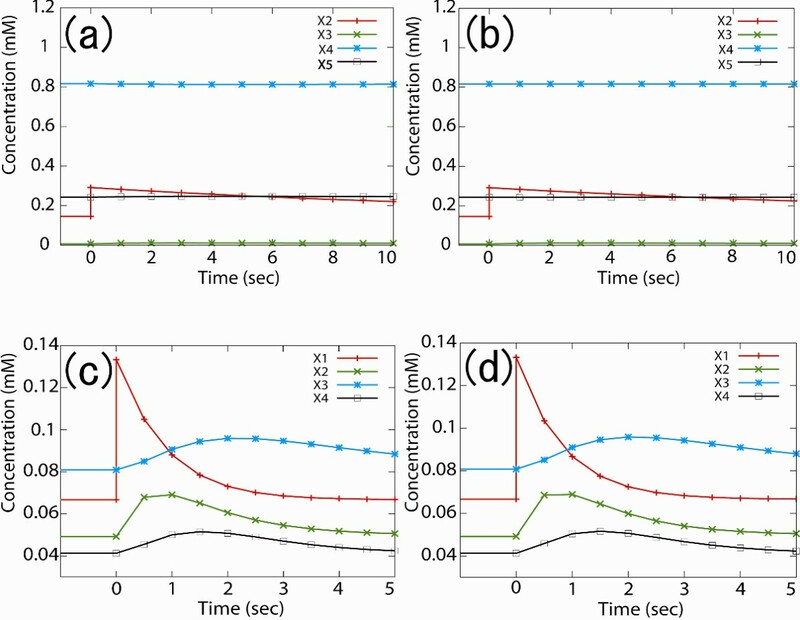 In their paper, they suggested that one strategy for selecting possible patterns is to perform perturbation experiments and to measure the corresponding dynamic response. For practical application of this approach, it is crucial to develop appropriate ways of performing the required experiments; however, measuring the logarithmic gain resulting from various steady-state fluxes is not practical due to a lack of exhaustive measurement method. Our approach can be used to develop reasonably accurate models of metabolic pathways by using a single set of appropriate steady-state flux profiles. Although steady-state flux profile data remains difficult to be measured directly and comprehensively, several methods of measuring steady-state flux profiles by using isotopes have been developed [22, 23]. Our method assumes that the Jacobian obtained is accurate. Therefore it is important to obtain time-course data reflecting transient dynamics after a suitably small perturbation in which the Jacobian behaves in a linear manner . Comprehensive metabolome data will undoubtedly accumulate as a consequence of advances in metabolic measurement techniques [24–26]. In our laboratory we have developed a high-throughput technique using capillary-electrophoresis mass spectrometry that provides effective time-course data involving a few hundred ionic metabolites [27, 28]. Our method promises to provide high-throughput modelling of large-scale metabolic pathways by exploiting the accumulating metabolome and steady-state flux profile data along with the anticipated developments in metabolome measurement techniques. Our method provides stable and high-throughput S-system modelling of metabolic pathways because it drastically reduces underspecified parameters by employing the steady-state flux profile and Jacobian retrieved from time-course data. S-system models generated by this method can provide accurate simulations within a wide range around the steady-state point. In combination with the metabolome measurement techniques it should permit high-throughput modelling of large-scale metabolic pathways. The model of the yeast galactose utilization pathway was constructed by Atauri et al. , whose reaction map is presented in Figure 1. The parameters used are available in reference . The calculated steady-state conditions were: X1; 0.5 mM (fixed), X2; 0.146 mM, X3; 0.00703 mM, X4; 0.817 mM, X5; 0.243 mM, and the flux through the pathway; 0.0081 mM·s-1. Tomoya Kitayama, Ayako Kinoshita contributed equally to this work. We thank Kazunari Kaizu and Katsuyuki Yugi for insightful discussions and providing technical advice. This work was supported in part by a grant from Leading Project for Biosimulation, Keio University, The Ministry of Education, Culture, Sports, Science and Technology (MEXT); a grant from CREST, JST; a grant from New Energy and Industrial Technology Development and Organization (NEDO) of the Ministry of Economy, Trade and Industry of Japan (Development of a Technological Infrastructure for Industrial Bioprocess Project); and a grant-in-aid from the Ministry of Education, Culture, Sports, Science and Technology for the 21st Century Centre of Excellence (COE) Program (Understanding and Control of Life's Function via Systems Biology). Kitayama contributed to the development of the modelling method. Kinoshita supported the development of the mathematical theory of this method and wrote this manuscript. Sugimoto designed two experiments for method verification. Nakayama provided the basic ideas and directed the project, and Tomita was the project leader.